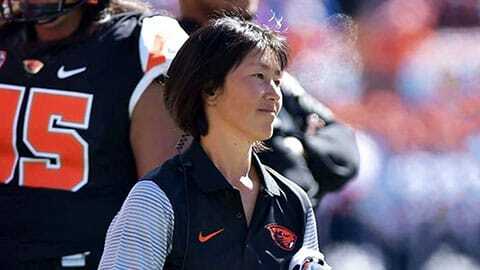 The Athletic Training curriculum at Oregon State University will prepare you to become an athletic trainer. As an athletic trainer, you will collaborate with physicians to provide preventive services, emergency care, clinical diagnosis, therapeutic intervention and rehabilitation of injuries and medical conditions. Students who successfully complete a degree in Athletic Training from an accredited athletic training program are eligible to sit for the Board of Certification (BOC) examination. BOC certification (ATC) establishes the entry-level credential to work as an athletic trainer. The Bureau of Labor Statistics estimates a 23 percent increase in job growth for athletic trainers from 2016-26. 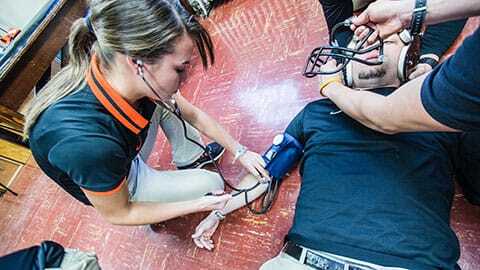 Oregon State University has a long history of preparing students for a career in athletic training. From 1974 to 2017 OSU had an accredited undergraduate athletic training program. Starting in the summer of 2016, the first cohort of students started in the new professional master’s program in athletic training. The new master’s program was granted accreditation by the Commission on Accreditation of Athletic Training Education (CAATE) in the summer of 2017. View the OSU Athletic Training Program's Mission, goals and objectives. Information, admissions and resources for prospective AT students. Information and resources for current AT students. Resources to ensure a positive learning experience at your clinical site. A survey of Oregon high school athletic directors on their schools preparedness for a catastrophic injury or health event found that only 11 percent of those responding had implemented three primary best-practice recommendations for treating their student-athletes. In terms of my teaching, I hope the students come out prepared and ready to provide quality care to their patients," Sam says.